Animals & Giraffes is a project combining the poetry of Claudia La Rocco with sound-based improvisations by Bay Area musicians. It’s music for thinking, with La Rocco’s deadpan delivery as a central point, orbited by the stillness of the music. The project is the brainchild of saxophonist Phillip Greenlief, who was looking for an avenue for mixing text and music. He appears two tracks, and he was at the remixing board for a few others, but his real contribution is the shaping of the overall project, recruiting Bay Area musicians to contribute — different players and different sounds for just about every track. He also appears on “The Ferry Is Turning Course Now, Away From the Sun,” pitting small scribbles against Karen Stackpole’s muted bells and gongs. At the song’s peak, the music builds patiently against La Rocco’s traffic jam of run-on sentences and tiny bits of repetition. “Public Access” is an interesting departure. It appears to be a straight conversation between David Boyce and La Rocco, couched as a two-way interview. The backing of Boyce’s saxophone and electronics starts at an innocuous level but intensifies as Greenlief, at the mixing board, warps it into more sinister shape by the end of the 7-minute piece. For me, Animals & Giraffes works better as an experience than as a document. The lingering atmosphere could be captivating in a live performance, as in the video above. The text’s shifting landscape takes a kind of concentration that I’m having trouble latching onto in CD form — but I do enjoy the variety of musicians on the disc, and the “Public Access” experiment works well. 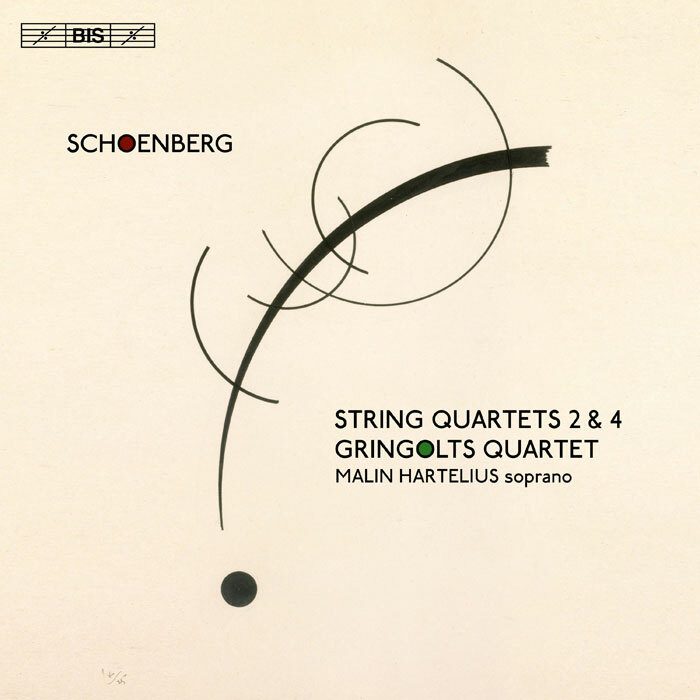 Intrigued by a review in BBC Music magazine, I gave this album a try: Schoenberg’s String Quartets Nos. 2 and 4, by the Gringolts Quartet (Bis, 2017). The quartets were written 30 years apart and document different phases in Schoenberg’s 12-tone composing. The Art Music Lounge blog provides a good review with historical context. Both BBC Music and Art Music Lounge describe the Second quartet as more accessible than the Fourth. But to me, it’s the opposite. That’s partly because the Second quartet includes two movements with a soprano — in this case, Malin Hartelius — singing lines of poetry by Stefan George. I’ve yet to develop a good ear for classical art-singing; to me, it sounds wandering and aimless. By contrast, the jumpy twelve-tone lines of the Fourth quartet sound fun and even catchy — even though an ordinary listener might call them “aimless” too. It’s probably the result of all the post-Schoenberg modern jazz and improv I’ve listened to. So my mind wandered during the Second, and I started getting curious about that album cover art. Where did it come from? I could have made a good guess if I’d thought about it. In fact, as I discovered in a web search, this piece has been used as cover art a few different times — such as the album Signs, Games & Messages: Works for Solo Violin by Bartók and Kurtág (Resonus, 2016) by violinist Simon Smith. It’s also on the cover of a book: Poetics in a New Key — essays by, and interviews with, poet Marjorie Perloff. It’s hard for me to resist a connection like this, so later, I got curious about Kurtág’s Signs and started listening to samples of Simon’s interpretation. I didn’t recognize the music, but after a while, I began to remember I already owned something else of Kurtág’s. I riffled through my digital collection and found Kim Kashkashian’s viola version of Signs. That’s when I remembered. I don’t like Signs. Several listens to Kashkashian’s version left me cold — which I hate to say, because I’m a fan of hers, and because Kurtág is still living and, charmingly, records and performs piano duets with his wife. How can you not love that? Still, Signs doesn’t click with me. It’s a set of miniatures — an evolving set that Kurtág is still adding to, so recordings vary depending on which handful of pieces the soloist picks. That aspect is intriguing. But the miniatures themselves feel like incomplete doodles. I’m not able to channel them together into a “story.” Maybe it’s just that Kurtág and I just aren’t on the same wavelength. My dislike of Signs matters to me, though. The subsequent institutionalisation of the techniques he developed in those decisive months has produced hour upon hour of greyness … Atonal harmony and fragmented melody are still powerful expressive tools, as film composers demonstrate whenever their directors need a musical equivalent for psychological distress, but as the habitual texture of contemporary classical music their routine use has stripped them of meaning. Even though he has a point, I can honestly say I enjoy some of those gray expanses. For example, I went to explore Schoenberg’s String Quartet No. 3, just because it isn’t on the Gringolts album. 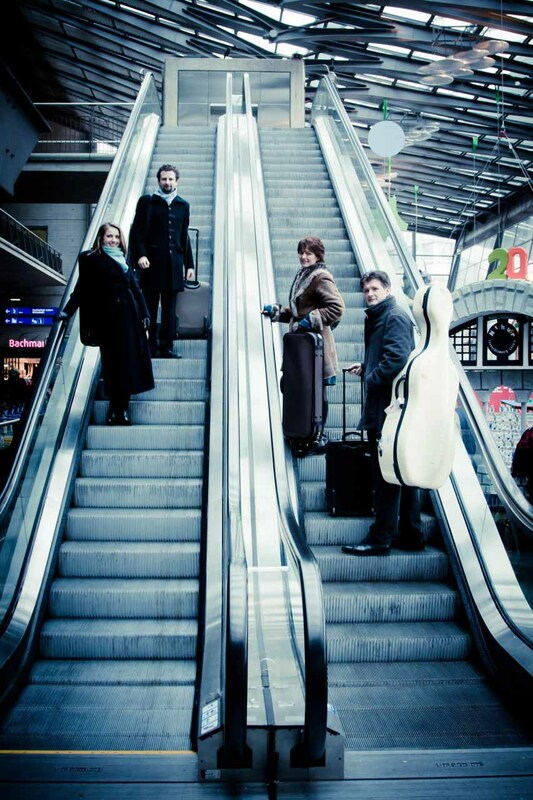 Art Music Lounge describes the Fourth quartet as “much more accessible than his Third Quartet, at least trying to follow a cohesive melodic line much of the time” — so I couldn’t resist diving into the potential incohesion of the Third quartet. But you know what? I liked it. It’s engaging — bouncy and rhythmic, with small spurts of repetition to help ground the listener and create a sense of progression. And I’m confident that this isn’t just me being pretentious, because — as with Signs — I’ve discovered that it’s possible for me to not like modern music. Oh, as for that minimalist, curvy-pointy cover art … it’s by Wassily Kandinsky. Yeah, I shoulda known. New combinations of familiar names always make for a compelling bill in jazz or improv. I don’t think I’ve encountered any two of Zeena Parkins, Miya Masaoka, and Myra Melford together in any project, so the idea of all three dabbling together in the studio is irresistible. It’s an all-strings combo — Melford on piano, Masaoka on koto, and Parkins on harp — but Parkins also adds electronics for a wider range of sounds and a sense of sustain. They explore a wide set of strategies and moods on MZM. “Bug” goes for a straightforward attack, driven at times by a pulsing of dense piano chords. Along similar lines, “Eight-Burst” is a briskly moving piece that turns up the electronics from Parkins, coupled with some frenzied koto and splashy, jazzy piano from Melford. On the slower side, “Saturn” tracks an appropriately spacey vibe, spiced by reverb on the koto. “Rosette” and “Spiral” likewise provide good doses of creeping, lingering atmosphere. The latter builds from the koto’s rich, mysterious twang in pure form. Melford sprinkles icicles from what might be a toy keyboard, while Parkins provides a deep throb of a bassline, subtly moving underneath. I like the tight-knit rumble in the piano on “Retina,” which eases up as the piece progresses. And then there’s “Ant,” an edgy track full of small, curled-up sounds. It plows forward on the back of a stumbling piano non-rhythm and small stabs of koto, led by squelching electronics. It feels like a conscious effort to create something different, and it works — a new shape architected by three masterful improvisers. I did make it up to Oakland for the Dialectical Imagination show that took place the day after Christmas. The Octopus Literary Salon is a small place, with a capacity of maybe a few dozen in SRO conditions, but when it fills up, as it did on this night, it makes for a cozy, lively atmosphere. Certainly a lot of people were friends and family of the musicians, but that’s OK — it’s community, and it felt good. Dialectical Imagination is the duo of Eli Wallace on piano and Rob Pumpelly on drums, building grand towers of classical and jazz. In support of their second album of 2017, they played three long compositions, filling the little space with sound. The first included a row of sleigh bells as an instrument, kind of a nod to the season. The piece maintained a highbrow, regal sound, taking a stance of grace and nobility. If that first piece came from one direction — from a place of grace and nobility — the second, “Hatch,” seemed to come from all angles at once. It was more aggressive and featured a powerful drum solo, where Wallace got up from the piano, hopping and dancing in place while shaking bells madly, his hair disheveled from the beanie he’d been wearing. They closed with a song that included some lovely and borderline new agey melody — but with enough intensity to be Not Safe for the Hallmark Network. Lots of chromatic soloing that veered off the rails. One of the opening acts was Wallace’s Brooklyn roommate, saxophonist Ben Cohen, fronting a trio calling itself 1_lu_1. Cohen and a guitarist fronted the music, but I found myself really impressed by the drummer. His style looked physically awkward at first, but he did just fine and brought a good flow to the music. The individual choices made by Cohen and the guitarist didn’t always work for me, but even at those moments, the trio melded well, making for some satisfying improvisations. Solo electric guitarist Jack Radsliff, from Eugene, Oregon, led off. He played pretty, melodic pieces augmented by some loops — all of it stemming from some involved, fancy fingerwork. His short set held the audience’s attention and was a nice, relaxed way to kick things off. This is cute: A band crammed into an elevator for one number. Probably not the first time this has been done, but it makes for a novel video. I love the way the vibraphone exactly fits the space. Makes it even more cramped. The band is a quartet fronted by drummer Chris Hewitt, and the tune is “Sixteen Bars for Jail,” by Ches Smith. You’ll find the original on the album Finally Out of My Hands (Skirl, 2010).